The Ruger M77 Hawkeye Predator is a small caliber bolt action varmint rifle that comes in .204 ruger, .22-25 Remington, and .223 Remington. 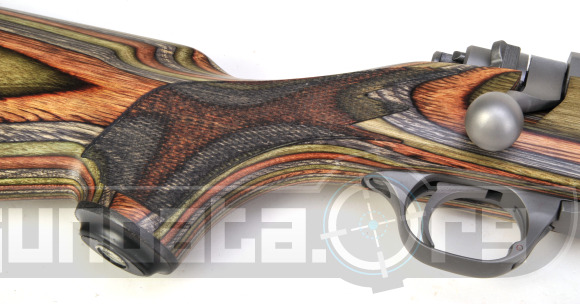 lets have a look at this strange laminated varmint sniper. 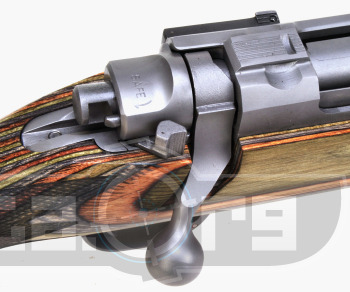 This gun has that Green Mountain laminate stock that is so cool looking. Once you've seen it you won't forge it, pretty trippy. MSRP on this gun is $999, weight is around 8lbs with not ammo, barrel length is 24" on the .204 and .22-250, and 22" on the .223 remington. This gun has an overall length of 44" on the .204 and 22-250, and just 42" on the .223 All 3 calibers have 6 grooves total. All in a very good looking, small caliber, fun to shoot, bolt action rifle great for the farm or just for kicks. If you have the money and want to invest in a quality product that is accurate and will last we suggest you at least check this gun out. That Green Mt stock isn't for everyone, but if you like that sorta thing this gun might just fly.